Oceanside Jewelers offers a variety of jewelry appraisal services to Carlsbad, La Costa, and North County area, whether it is for insurance purposes, trust and estate management, or retail assessment. Nowadays it is common for insurers to require any items above $1500 in value to be individually assessed and scheduled on their policies. 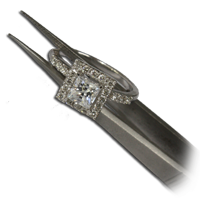 It is common for jewelry stores to write over-inflated appraisals on their inventory to make a piece look like a great value. However the truth is that insurers will pay the jeweler directly in the case of a replacement claim and in the long-run, inflated appraisals only cost the consumer in high insurance premiums. Accurate jewelry appraisals are also extremely important in the assessment of trusts and estates to in order to ensure equitable and appropriate allocations of items. At Oceanside Jewelers we provide you with a fair and comprehensive market replacement value in order to avoid these issues. All of our appraisals are done by a master jeweler and a certified GIA graduate gemologist, providing a complete and accurate estimate of a piece’s materials, precious stones, labor cost, and collectable value. We also offer on-site appraisals in the local area. Next time you’re searching jewelry appraisals Carlsbad, La Costa, or North County, give us a call! For more information on our appraisal services, check out our main page here. –Diamond and Precious metal brokering: Whether you are buying or selling gold, silver, platinum, or diamonds, Oceanside Jewelers can make you a highly competitive offer, as well as a free no obligation estimate! –Wholesale Repairs, Manufacturing, and Trade Services: We provide a complete line of Jewelry production and trade services, including repairs, design and modeling, and manufacturing in a wide variety of styles and materials. – Cash for jewelry and fine watches: We offer highly competitive cash payouts for gold, silver, platinum, diamonds, and fine watches, and offer a free no-obligation estimate on your valuables!